Characters, obviously, are incredibly important pieces in a story. They're also really fun to craft and develop. But if you jump into writing a story without knowing very much about your character, you're going to end up with a piece of writing that nobody is going to care about. Why? Because in order for someone to care about the story, they have to care about the character. And for that to happen, the character needs to be realistic. I've been told many times after having someone read my writing that my characters are very easy to feel for and seem very real. This is because I put in a lot of work when it comes to crafting my characters, as well as placing them in my story. I don't simply think of a name and go from there. I get to know my character before I write them, and it really helps bring the story to life. 1. Put them through a questionnaire. I love character questionnaires, but not all of them. Some questionnaires are kind of stupid because they ask things about your character that really, truly do not matter. At all. But certain questionnaires are extremely helpful because they allow you to look deeper into the personality of your character as well as their speech patterns and personal mannerisms, which can be really helpful to know. My favorite questionnaire that I always use when I have a new character is Attaching the Flesh because it dives into the character's personal traits as well as emotions, values, and beliefs. When you know your character inside and out, his or her personality and mannerisms will show in your writing and make the character feel real. 2. Make a list. Open a word document and write a list of all the little details about your character. How they sleep, what their biggest pet peeve is, their worst fear, etc. When I did this for my characters from Unperfected, I learned that one of my main characters loves to be kissed on the cheek. That discovery led to an overall change in his character--from a tough and protective older brother to a troubled young man who is actually very kind and sincere if you break his shell. So try it! You'll be surprised at how helpful this technique can be. 3. Test their reactions. Go online and find a list of scenarios or story prompts, or think up some of your own. What would your character do in that situation? If their hair suddenly caught on fire, would they burst into tears? Would they scream and frantically try to put it out? Doing this kind of exercise really opens up your mind and allows you to view your character in a place that's different from their usual story world. 4. Write future snippets. I recommend doing this after you've written a good deal of your story, but if you want, you can do it whenever. Take your character and push them a few years into the future, after your story ends. What are they doing? Are they married? Do they have kids? I also did this with my characters from Unperfected before I wrote the second book. I wrote a scene where my main character was telling her husband that she was pregnant (and yes, I geeked out over my own characters as I wrote it.) To my surprise, this helped me develop my main character more than I thought it would and I was able to get a feel for how different she'll be at the end of my series. 5. Do your research. Does your character have ADHD? Depression? PTSD? If you're writing someone who struggles with anxiety and has panic attacks a lot, you may want to do some research on those things to better understand them as well as your character. The same goes for the other things I mentioned above. 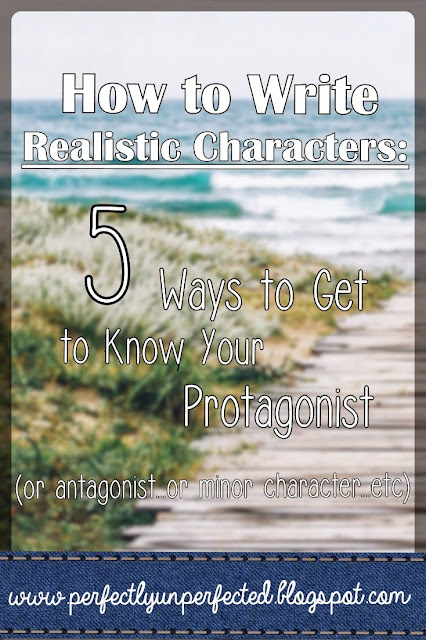 Having an understanding of an issue your character has can help better your writing and make that character seem much more well-rounded and realistic. These are just a few of the things I do to help me get to know my characters, and you can do them to! It's amazing at how useful some of these techniques are. Who knows--they might just give your characters the extra little spark they need to seem realistic and make your story shine.